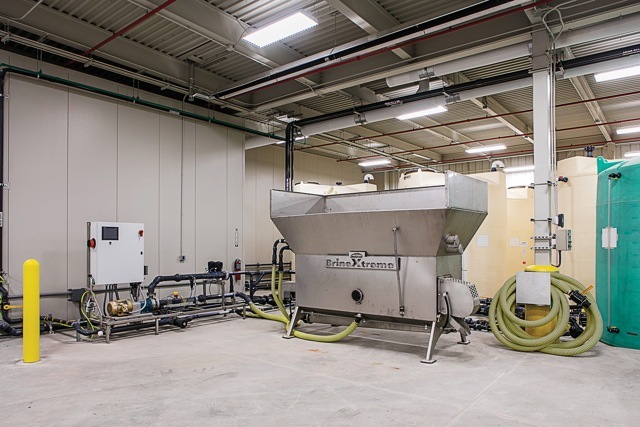 Even before rock salt prices got, well, saltier, officials in the city of Farmington Hills, Mich., looked for a way to reduce costs by starting their own municipal brine production facility. Mr. Kevin McCarthy, superintendent of the Department of Public Works for Farmington Hills, explained the city uses the brine in more ways than one. “We use it for anti-icing up to three days before (storms), for pre-wetting salt before applying it and in lieu of salt for direct application,” he explained. According to a presentation McCarthy and Bryan Pickworth, road supervisor and project manager recently gave at the American Public Works Association’s 2017 North American Snow Conference, Farmington Hills is approximately 33 square miles, 170 lane miles of major roads, 520 miles local roads and six major snow routes that are approximately 28 lane miles each. There are also 44 lane miles of gravel roads. Prior to using brine, the city was using on average 12,000 tons of rock salt a year. They’ve cut that amount by more than half. McCarthy said on average they use 5,000 tons of rock salt annually, and in a recent bad winter, they used about 6,300 tons. He said it takes 9,000 gallons of brine to anti-ice the city, which the public works department started producing in 2005. So they had an employee dedicated to the brine production in order to keep up; however, McCarthy saw it was paying off in cost savings on the amount of salt the city had to purchase, and by pre-wetting the salt workers were laying down, it was eliminating waste. “As demand and benefits increased, we knew we had to have better equipment and new ways to store the salt and brine,” he said. So the department started looking at different plans, knowing that in the state of Michigan, if they were going to store more than 1,000 gallons, it had to be inside and in containers like hazardous materials. At the same time it was planning, city officials decided to build a new water tower located behind the public works brine facility. The water tower project was going to take away one of their two salt domes — its 1,200-ton dome — leaving only the one with 3,700-ton storage capacity. The 3-million-gallon, 207-foot-tall tower was going to take three years of construction causing disruption to the brine facility’s operation; additionally, the project would leave a 30-inch water main going through its site. Because of the water tower project’s impact on operations, the public works department was able to tack on to the project to receive funding for the brine facility’s addition and improvements. McCarthy said the project was about $13-$14 million, and the new brine production facility portion was about $2 million. The construction costs were approximately $1.6 million and the new brine system cost about $180,000. “We just had to convince the city council this was the way to go,” McCarthy said, adding that since the project was going to save the city money, it wasn’t too hard of a sell. The ground breaking for the new addition occurred in late spring of 2015, and employees moved into the facility in October, according to McCarthy. 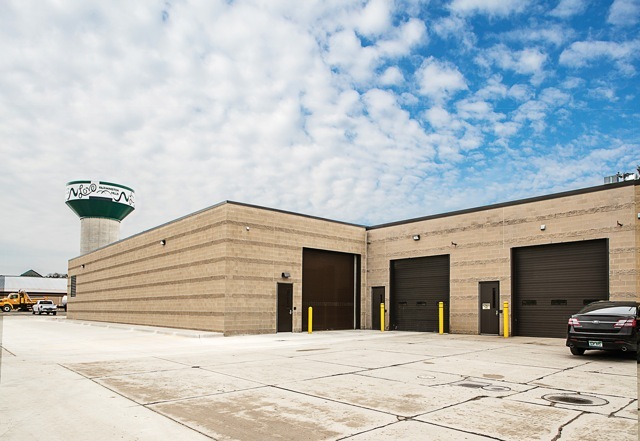 The department now has capacity for 30,500 gallons of brine storage in the heated building and 36,000 gallons of anti-icing fluid blend storage and 6,000 gallons of storage for offloading for a total of 72,000 gallons of total storage. McCarthy said they constructed everything so it wouldn’t corrode from the salt — from the concrete floors and the 6-inch-diameter trough around the system so the brine doesn’t escape to the powder coating on anything metal. 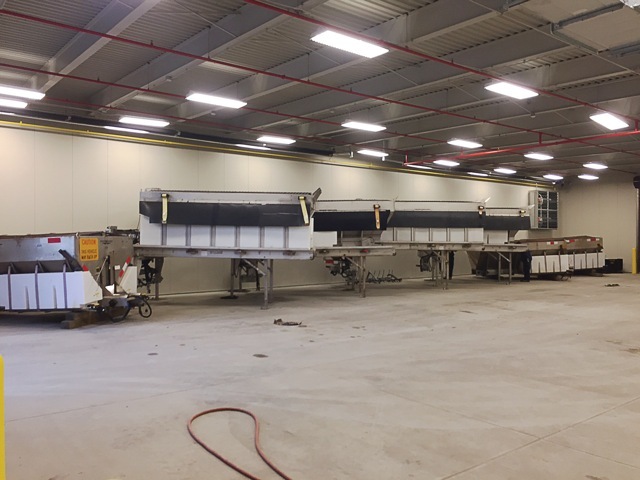 The brine manufacturing system is now fully automated. Workers just have to load the machine with salt and it does all the analysis of the salinity. They can now produce 4,000-6,000 gallons of brine per hour versus the 800 gallons with the old system. There are three fill points besides the pump so workers can fill three trucks at once rather than just one, and they no longer have to wait to clean the machine before filling another truck. The system has a high-tech air flow system. There’s enough space for indoor delivery of liquid additives, and there’s storage space for off-season equipment, too. McCarthy further explained the additional ways his department uses the brine rather than just for direct application. He said they’re able to anti-ice up to three days prior to weather turning bad because they add sugar beet juice to the salt mix so the brine is “stickier and stays on the road better.” He said the carbohydrates in the sugar beets also make it easier to scrape off the roads. An analogy he uses when describing the process is the difference between giving a child an ice cube to try to chew on versus a Popsicle — they both are made with frozen water, but the sugar and juice added to the Popsicle makes it easier to chew. When doing preemptive anti-icing, he said they watch the pavement temperatures, which could vary quite a bit from air temperature. “It could be 10 degrees outside, but the pavement is 34 degrees or the air might be warmer and it’s only 5 degrees on the pavement,” he said. He said the department manufactures brine for about 6 cents a gallon, and early anti-icing is usually done on major roads so it’s not a major concern even if the weather or temperature doesn’t get as bad as expected. The department also uses the brine to pre-wet the salt workers plan to apply directly to the roads. 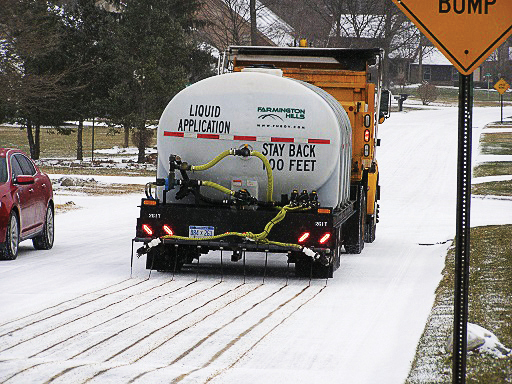 And of course workers use the brine in lieu of salt for direct application on the icy and snowy roads. Farmington Hills uses traditional rock salt turned into brine versus organic brine pulled up from the ground. McCarthy said the organic well brine is not pure sodium chloride; it also contains other minerals like magnesium chloride or calcium chloride. “We think it changes the characteristics of the brine, and it’s harder on the equipment — it’s more corrosive,” he said. According to McCarthy, there are numerous benefits of this new facility. The increased production of brine has resulted in 80 percent savings on salt; the city is also using 50 percent less than before and it has less waste. He said that there was a time when the city was paying $20-$25 a ton for rock salt, but around 2011-2012 when fuel prices skyrocketed to over $4 a gallon, the salt prices went as high as $100 a ton. Currently, his department is paying approximately $56 a ton. The quicker fill time of the trucks means more hours spent on the road. The city is also seeing savings on labor because they don’t have to have someone watching the system, and employees don’t get called out so early since they are able to do the anti-icing in advance. The increased space allows for the storage of off-season equipment inside the facility so the equipment is better maintained. The city can also purchase larger quantities of salt and additives, like the sugar beet juice, resulting in better prices. There are also environmental benefits, including the reduction of salt used and the decrease of salt leaving roadways as runoff into streams and fields. This practice also keeps it from corroding vehicles and lawns. McCarthy said the idea of municipalities producing their own brine is catching on. He certainly recommends it, and he and his staff have been speaking at conferences about Farmington Hills’ experience. He said Farmington Hills has other communities coming to them now for brine. He suggested adding a spray bar to a truck and getting brine elsewhere, or getting into an agreement with neighboring communities to build a facility that all can use and benefit from. When McCarthy runs across a skeptic, he said he fills a 2- to 3-gallon weed sprayer bottle with brine and tells the person to take it home and try it on his or her driveway. “Test it out — see how easy it is to scrape up,” he tells them. McCarthy said the test run usually makes a believer out of the person and the cost savings gets city officials on board.